Article by dans The Altivist (Danemark, november 2016). 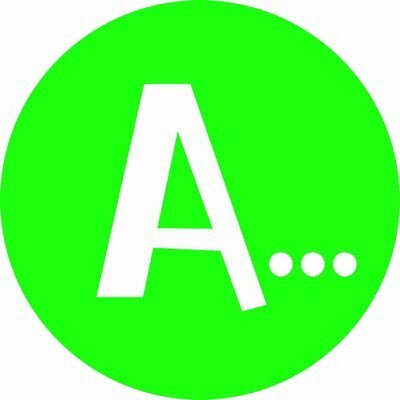 Can you explain your association and movement? For instance, what are your cause, motivation, and results? #JamaisSansElles first started as a call, signed by a small group of people gathering influent leaders in the field of digital economy, as well as artists and academics. In this call, the male signatories committed themselves to not attend any more public conferences or round table, and to be part of any committee, panel, jury or group of experts, if there is no women among the speakers or among its members. Hence the name “Jamais sans elles”, which means “never without them”, but with the feminine form of the pronoun “them”, which is distinct and easily identifiable in French. The general goal is to promote what is called in French “mixity”, which is simply the presence of both men and women in a given place, environment or institution. In other words, #JamaisSansElles is fighting gender discrimination, but in a rather original way: by direct refusal of taking part to it, at the level of individuals. It is based on the simple realisation that one doesn’t need a law, quotas or any sort of direct incentive to promote and establish “mixity”. Every citizen, at his own level and in its own environment, can apply the founding principle of #JamaisSansElles. Following this call, diffused in the media and mostly through the social network Twitter, we then created an association to accompany the very strong dynamics that it generated, and it finally became a real movement, which goes beyond our initial expectations, as more and more people are adopting the hashtag and sharing information and comments about gender dissymmetry while referring to our initiative, and propagating it in a wide range of environments and contexts. Of course, the association #JamaisSansElles has two presidents: one female (Tatiana F. Salomon) and one male (Guy Mamou-Mani). The trigger of the movement was essentially exasperation, but for a change, exasperation of men, not women! It was probably bound to occur. The absence of women in the most visible places – not only in the circles of power, but also in the various instances of public representation, communication, expertise or analysis of any sort (from economics to sport, through art, science or literature) – this absence of women was bound to become visible to everyone and, by becoming visible, to become unacceptable. And it is really encouraging (and reassuring!) 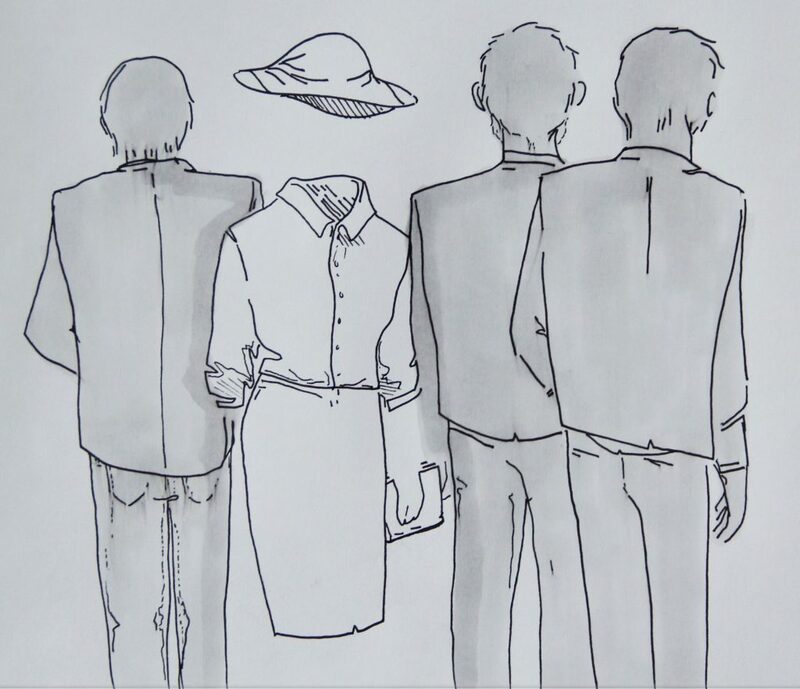 that some men indeed started to be uncomfortable, and even annoyed to find themselves surrounded only by other men in so many conferences, panels or TV programs. They felt something was obviously wrong in such situations. And if one is concerned with gender equity, then why keep being accomplice in a situation that is so obviously unbalanced? It thus imposes a levelling-up, and induces a sort of snowball effect. And it has proved quite efficient so far. Not only the organisers of round tables or conferences try to avoid being turned down by #JamaisSansElles signatories, but some of them even engage themselves behind the movement, and seek the official label of our association for their events. In a few months, 12 events have received the #JamaisSansElles label in France. Between 200 and 300 women have been given the possibility to speak at various events and conferences supporting #JamaisSansElles. 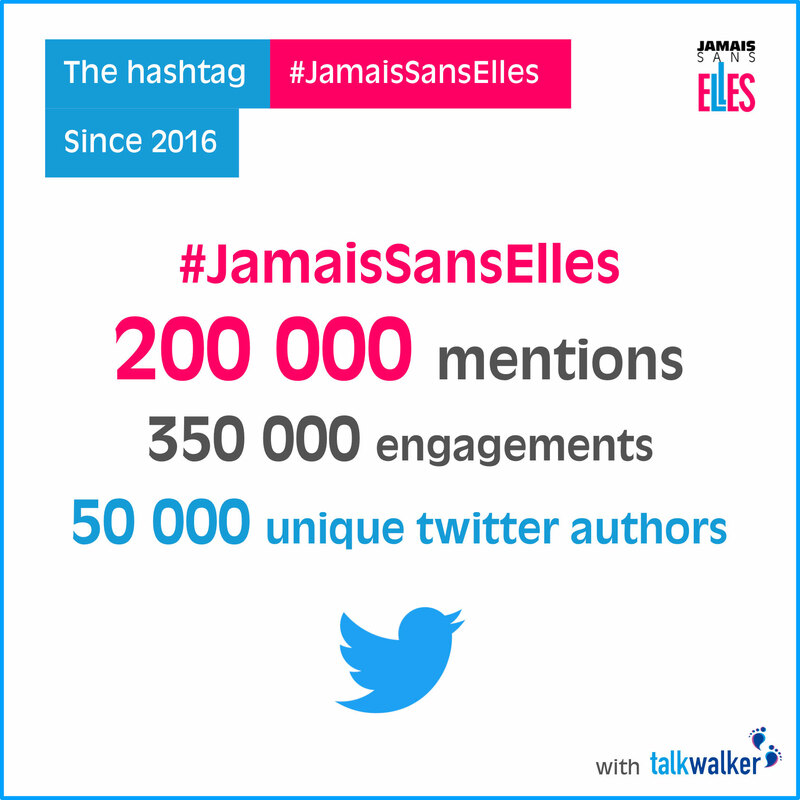 To date, #JamaisSansElles has reached more than 27 million people on Twitter (175 million “impressions”). Among the many male leaders who have signed the call in France (entrepreneurs, key actors in the digital economy, media, education, politics…), we may cite Gilles Babinet, entrepreneur and the French Digital Champion at the European Commission, or Stéphane Richard, CEO of the group Orange. Even the one who is currently ranking first in the poles for the presidential election in France next year has signed the call! What are the most striking facts and statistics about equality and diversity that you know of? According to a recent report of the World Economic Forum, at the present rate, it will take 170 years until a real equality between men and women is reached in their work environment. This won’t occur until 2186! Also, according to the McKinsey Global Institute, advancing women’s equality could add 10 000 billion Euros in the global growth by 2025 (i.e. 11% of the annual worldwide GDP). What are three actions that one (either as a person or part of a larger organisation, educational environment, or a political party etc.) can do to promote and advance diversity and equality? The solution is… common sense! A common sense which makes men perceive how absurd or even ludicrous it is to participate in a public event so obviously unbalanced that there would be no single women among the contributors. And as soon as women are becoming more visible in all contexts (social, political, scientific, economic, etc. ), all of the factors that curb women access to public speech and public space will recede. The power of example and the evidence of equal competence and skills will become manifest. But it is important that this fight be fought by everyone, based on individual responsibility rather than law, and also that women refrain from putting themselves in a quasi-subordinate position to request or even beg for a recognition and a public exposure that should be neither a grace nor a favour, but the mere recognition of a full-fledged legitimacy. Now, if you are yourself a leader or an expert and often participate to conferences, you can commit yourself and suggest women contributors to the organisers. And if you are organising events, you can also engage yourselves behind #JamaisSansElles. #JamaisSansElles offers a way out of the long dead lock of discussing gender quotas, that both supporters and protesters recognise contain flaws and possible pitfalls. It does so, because we, as individuals, want to be represented because of our knowledge and skills, not simplistic character traits like gender – or ethnicity, religion and/or demography for that matter. In fact, a valid position is, that the introduction of quotas might make some socially determined problems even more significant. This is the case, if people are left with a feeling of being chosen to do, what they do, based alone on an archaic construction of gender and because a quota is to be met. With the direct action that #JamaisSansElles proposes the overarching ambition and aspiration are to create awareness amongst actors involved in politics, public affairs and the media. It is a call to action that reminds both facilitators and participants that considerations of representation in terms of gender equality and diversity are fundamental parameters that, by looking at statistics, for far too long have been undermined and underestimated. We might all agree that something needs to be done, and #JamaisSansElles probes us to get up of our seats to act on the imbalance. The irony here is that #JamaisSansElles sometimes want you to act by staying seated. They call upon this action as it is meaningful not to invest time or indirectly support a clear gender biased debating platform, simply because it lacks real representation. By accepting invitations blindly one loses a key element to politics; those who are invited gets the say, forms the discourses and becomes the image and representation for certain views and standpoints. The Altivist regards this approach as an actual, pragmatic stance against male-dominated political thinking. It is urgent in both an international and Danish context to raise the level of female participants. And so are people from different socio-economic, ethnic or religious backgrounds. This rhetorical dead-end has been duped as ‘whataboutism’. A situation that is not exactly fruitful or constructive for actually dealing and discussing solutions. While the discussions of other asymmetric representation are equally important, this is just, hopefully, the beginning of an overhaul. We should all be appreciative of how a movement like #JamaisSansElles have revived the debates about women in politics. This is a step towards more action and a more constructive debate. We therefore welcome this revitalisation of the political progressives’ toolbox for actions that can drive discussions about equality and promote diversity outside the parliaments. 1. I will join #JamaisSansElles to give my support for a more equal, fair and realistic representation in political and public affairs. 2. I will as either a host or participant refrain from participating or arranging debates where only one gender is represented. I will make a positive encouragement to my colleagues or fellow participants to re-evaluate the total sum of representation to check if it is biased or if the diversity of the society as a whole is unevenly reflected. 3. My dedication to creating a more diverse and fair world does not stop with action number one or two. I will take part in a global movement or NGO, that fights for equal opportunities and representations for all. par Ulrik André Bøgelund. Illustration by Viola Wrede.